Television display technologies have come a long way since the first commercial color CRT was produced in 1954 and it was not until the late 1990s that LCD technology began to surface and display technologies started evolving at an unprecedented rate. Gone are the days when the conventional cathode ray tubes (CRT) were the only thing for television displays, the technology for which dates back to the early 19th century. Later the more efficient Liquid Crystal Displays (LCDs) came to the picture and which was quick to rise to fame because of its passive nature that combined characteristics of low power and bright light viewing, factors that made portability a reality. A similar technology, Light Emitting Diodes (LED) soon gained momentum as the dominant display technology until the more advanced and superior organic light-emitting diode (OLED) displays took over. Although OLEDs carry a price premium over LCDs and LEDs, the superior image quality of OLED, especially the beauty of its high contrast, is what makes them the future of television displays. What triggered OLED to become so popular was the rapid growth of smartphones. Now, we have entered into the next dimension of television displays with the next-gen Quantum Dots LED (QLED) displays that incorporate the best aspects of both organic light emitters and inorganic light emitters. We pit the two display technologies against each other to see which one’s better. OLED, short of organic light emitting diode, is the next big thing in display technologies that use organic glowing materials for their own illumination, thus eliminating the need for an LED backlight as with LCD displays. OLED display panels, as the name suggest, are nothing but organic light emitting diodes in which the emissive electroluminescent layer is a film of organic compound, which emits light in response to an electric current. As a result, they deliver superior, pristine and vibrant picture quality, and amazingly wide viewing angles for an exceptional viewing experience. 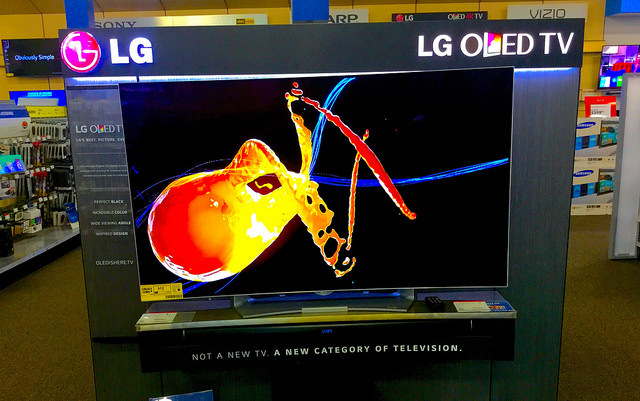 OLED technology is not limited to television displays; it is used in a wide range of commercial applications such as mobile phones and portable digital media players. Quantum Dot LED, or simply called a QLED, displays are the next generation of display technology based on quantum-dots light emitting diodes. The technology is quite similar to OLED display technology, but with a quantum dot layer instead of the OLED emitting layer. Quantum dots incorporate the best aspects of both organic light emitters and inorganic light emitters. They don’t emit the colors directly; in fact they create picture very differently by adding an additional layer of quantum dots which in turn dictates an ideal color temperature when hit by light from behind, resulting in an immersive viewing experience that sets in a new revolution in television display technologies. – Organic Light Emitting Diode (OLED) displays use organic glowing materials for their own illumination, thus eliminating the need for an LED backlight as with LCD displays. They are organic light emitting diodes in which the emissive electroluminescent layer is a film of organic compound, which emits light in response to an electric current. 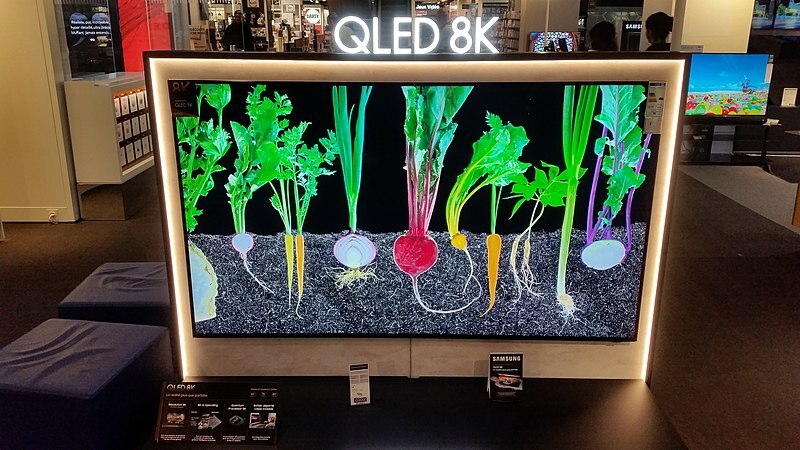 Quantum Dot LED (QLED) displays are based on quantum-dots light emitting diodes and the technology is quite similar to OLED display technology, but with a quantum dot layer instead of the OLED emitting layer. – The ability to produce deeper blacks is one of the most important factors in achieving a near-perfect picture quality and which also allows for vibrant colors and higher contrast. As every pixel in an OLED display panel illuminates light of its own, it achieves a near-perfect black level resulting in much brighter images without compromising dark areas surrounding them. QLED displays, on the other hand, suffer a little from light bleed, as it still relies on backlight behind an LCD display panel. OLED is clearly the winner in terms of achieving deeper blacks. – OLED displays, with its smaller diodes acting as single pixels which are so close to the surface, enjoy stunning picture quality without losing out on contrast, resulting in much sharper pictures with an optimal level of intensity that is hard to achieve in any other display technology. This results in exceptional picture quality, infinite contrast, and lifelike colors that together make everything so real. QLED displays, on the other hand, are awfully brighter than OLEDs, making them better suited for overly bright rooms. – While both OLED and QLED televisions deliver exceptional viewing experience when you’re sitting in the center exactly in front of your television, QLED displays tend to lose significant color and luster, losing significant amount of contrast when you’re looking at the television from far off-center. OLED televisions offer excellent viewing experience from all angles without compromising the color contrast and with no luminance degradation whatsoever. OLED has a clear advantage over QLED when it comes to drastic viewing angles. It’s really tough to choose one from OLED and QLED, as both are the most popular and dominant display technologies out there. Each has its own set of advantages in terms of picture quality, contrast, and color correction. That being said, if you are looking for a high-definition television for a much brighter room or something that gives consistent dynamic quality from HDR, then QLEDs are the best choice. OLED televisions are better at every aspect, be it black levels, contrast ratio, color depth, excellent viewing angles, and so on. So if you don’t worry about going on the higher side and still want to enjoy an immersive viewing experience from your TV, then OLEDs are way to go. Sagar Khillar. "Difference Between OLED and QLED." DifferenceBetween.net. 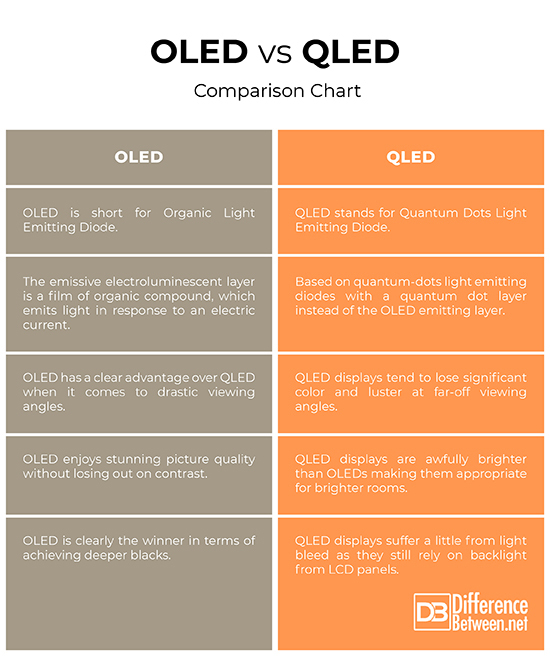 January 17, 2019 < http://www.differencebetween.net/technology/difference-between-oled-and-qled/ >.